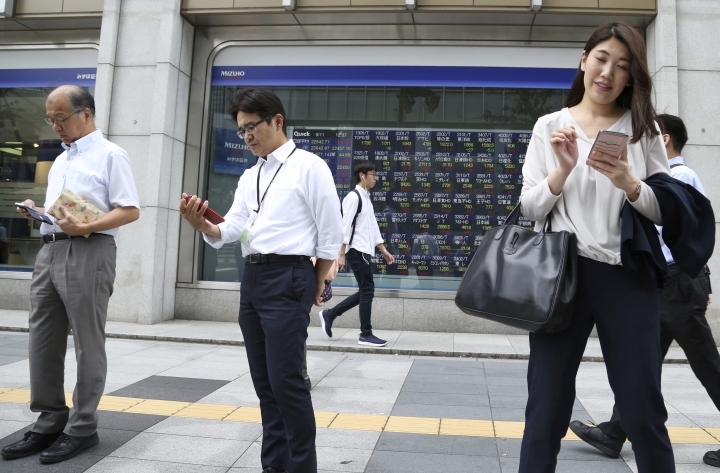 TOKYO — Global shares were mostly higher Wednesday despite jitters over the escalating trade dispute between the U.S. and China. KEEPING SCORE: France's CAC 40 edged up 0.3 percent to 5,380.16, while Germany's DAX gained 0.2 percent to 12,185.36. Britain's FTSE 100 was flat at 7,301.46. U.S. shares were set to rise with Dow futures up 0.1 percent at 26,325. S&P 500 futures were flat at 2,911.80. ASIA'S DAY: Japan's benchmark Nikkei 225 added 1.1 percent to finish at 23,672.52. Australia's S&P/ASX 200 was up 0.5 percent at 6,190.00. South Korea's Kospi was virtually unchanged at 2,308.46. Hong Kong's Hang Seng rose 1.2 percent to 27,407.37, while the Shanghai Composite gained 1.1 percent to 2,730.85, up 1.1 percent. Shares were higher in Taiwan and Southeast Asia. TRADE TENSIONS: The administration of President Donald Trump has decided to impose tariffs on an additional $200 billion of Chinese goods and China responded by saying it will increase tariffs on $60 billion worth of U.S. goods. On Wednesday, Chinese Premier Li Keqiang appealed to other countries to support Beijing in the standoff over its technology and trade. THE QUOTE: "As it is, the U.S. and China still sit on the brink of further ratcheting of trade tension, particularly with the latest Chinese tariffs targeting agricultural products and President Trump having vowed to bring out the next $267 billion of Chinese imports for tariffs implementation if so," Jingyi Pan of IG said in a commentary. ENERGY: Benchmark U.S. crude rose 18 cents to $70.03 per barrel in electronic trading on the New York Mercantile Exchange. It rose 1.4 percent to settle at $69.85 a barrel in New York Tuesday. Brent crude, used to price international oils, gained 2 cents to $79.05 a barrel. CURRENCIES: The dollar climbed to 112.40 yen from 112.36. The euro rose to $1.1715 from $1.1665.